AMS Widemouth Downpipes offer a more pronounced, throaty exhaust note under wide open throttle, yet are subdued at idle and while cruising. A perfectly balanced sound for the ultimate all around supercar! COBB would like to introduce its new and improved Nissan GT-R Catted Downpipes with cast bellmouth! COBB would like to introduce its new and improved Nissan GT-R Downpipes with cast bellmouth! 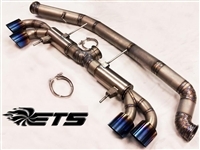 These ETS GTR downpipes add a nice throaty sound under WOT and maintain a nice idle that fits the GTR perfectly. Made for your 2009 or newer GTR, these JMF 3" (76mm) Downpipes fit like stock downpipes, with no clearance issues, and will increase the exhaust sound noticeably on your GTR. For any customer looking to max out their stock turbo or upgraded factory manifold turbo GTR, these are a must have! SBD's flanges are Cast Stainless Steel, featuring a Bell Mouth design for maximum flow. GTR turbo to downpipe flange, sold as a set of driver & pass. side flanges. Made from 1/2" 304 stainless steel. Extreme Turbo System's 4" Stainless Steel Exhaust System bolts directly up to the factory R35 GTR Y-Pipe! Extreme Turbo System's 4" Stainless Steel Exhaust System with Y-pipe. The Stainless Steel cats included on the AMS Alpha R35 GTR Catted Midpipe provide the highest level of emissions control with no notable loss in horsepower when compared to the competitor's catless midpipe. COBB Tuning is pleased to announce the 3.5-inch Stainless Steel catted Y-Pipe for the Nissan GT-R. 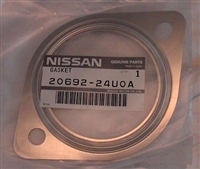 Extreme Turbo Systems Exhaust Flange Adapter Gasket Kit for your R35 GTR. Designed for your 2009 or newer GT-R, the JMF 3.5" (90mm) Y-pipe bolts up to the stock downpipes and most aftermarket exhaust systems, with no clearance issues. For those wanting to upgrade to a 90mm Midpipe, while retaining their factory 70mm exhaust, this is your answer for a tight seal.